Full Day Wedding Cover with Two Photographers – £950.00. Starting with bride/groom preparation, cover includes the ceremony, reception, speeches, cutting of the cake and first dance. Your professionally edited images will be available as a digital download within four weeks of your wedding. Large Handmade Deluxe Storybook with 75 images – £250.00. Extra Large Handmade Deluxe Storybook with 100 images – £350.00. Pre-wedding Shoot & Guest Book – £250.00. A relaxed shoot before the wedding; the images taken form the basis of a stunning centerpiece for your friends and family to sign on your special day. 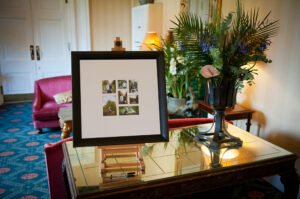 Pre-wedding Shoot & Signing Board (includes artist’s easel) – £300.00. Replica Parent Album – £150.00. Pair of Replica Parent Albums – £225.00. Personalised Luxury USB Case – £150.00. All your professionally edited wedding images, courier delivered.